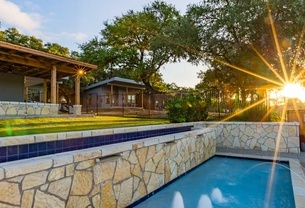 Perched back in the shady trees, along the peaceful banks of the San Marcos River, you will find the wonderful hill country retreat that we call River Houzz. This splendid 3-bedroom home is a truly unique find for all types of groups seeking a fun, relaxing weekend away from all the big city lights. 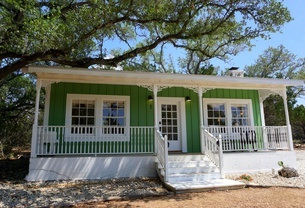 The Oak Lodge is located on the grounds of the Wimberley Log Cabins Resort and Suites situated just a couple of minutes from the downtown square and across the street from the Wimberley Market Day's pavilion. The Oak Lodge is a 3/2 log home sleeping up to 10 people. The massive living room has plenty of seating around a gorgeous decorative fireplace. The roomy kitchen has stainless steel appliances, plenty of counter space for communal cooking, and is open to the living and dining room. Treat yourself and your loved ones to a relaxing vacation at Rio De Los Suenos. The enchanting estate offers a marvelous 4-bedroom main house along with a detached 2-bedroom guesthouse. 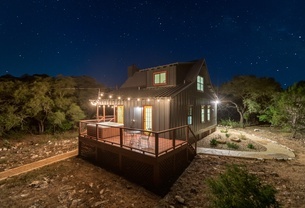 This one-of-a-kind property is located on several private, river front acres, few minutes from the Old Glory wedding venue and just a quick five-minute drive from the Wimberley downtown square. Welcome to the Cypress Creek Cabin at The Ranch at Wimberley. This surprisingly roomy cabin sleeps up to four guests on a property that entertains up to fifty. Dance Hall Cabin has one bedroom with a queen size bed, a loft with a full size air mattress, and a cozy pull out sofa in the living room. A full size bath with tub and a cute kitchen with a view round out the living accommodations. Outdoors is where you will really want to be. Relax on the porch and overlook the stunning nature that surrounds you. Go on a walk along the two miles of nature trails or take advantage of the Game Room where you can play billiards or table tennis. A resort style grill is available for the outdoor chefs in your party. Situated under an awning, guests can grill rain or shine. A beautiful pool and six person hot tub is also available for use depending on availability. 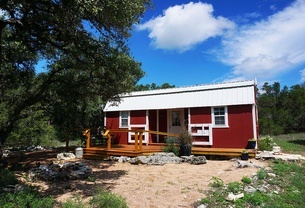 When you lose yourself in the Hill Country find yourself at The Ranch at Wimberley Cypress Creek Cabin. Peaceful and breathtaking, Blanco Rapids Ranch is a luxurious property that brings all the wonders of the Texas Hill Country into a single getaway. In addition to the main house, four other suites serve as a romantic hideaway on the property. Surrounded by gorgeous Oak trees and the sparkling cool water of the Blanco River this home has a magnificent porch and outdoor amenities. Guests can enjoy the impeccable view of the river or take a walk on the many acres of the property. Retama is located right on the gorgeous, crystal clear waters of the Blanco River not far from the Wimberley Town Square. With 300 feet of stunning river frontage right out your back door this newly-remodeled home is an ideal, peaceful getaway from the big city. 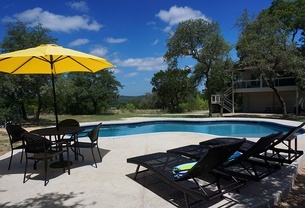 Huge oak trees welcome you to the Hill Country with branches like open arms. Beautiful, lush St. Augustine grass covers the entire property and invites you to grab your picnic blanket and a great book. Relax and let life pass you by while you read that long awaited novel on the banks of the tranquil river. As you enter the home a wall of beautiful eight foot doors beckon you to come in and enjoy the quiet and stillness of the Hill Country. A large spacious living room, designed for families to gather and enjoy the roaring wood burning fireplace, is open to the wonderful gourmet kitchen with upscale granite countertops and shiny stainless steel appliances. Guests will enjoy dinner served at the large dining table which can seat ten guests comfortably. Step inside this secluded gem on the Guadalupe River and indulge in the languid tranquility of the Hill Country. 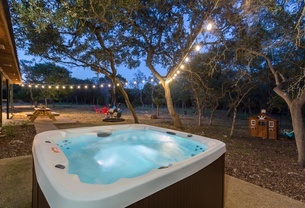 Located on two verdant acres of prime Spring Branch real estate, Just a River House offers any outdoor enthusiast boundless options for fun and relaxation. 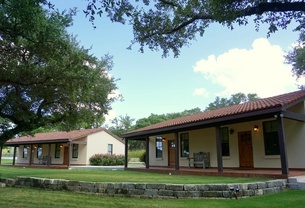 The Affinity Retreat is a private cabin on 15 acres. This charming property is equipped with 2 bedrooms with a split floor plan enhancing the privacy of all guests. 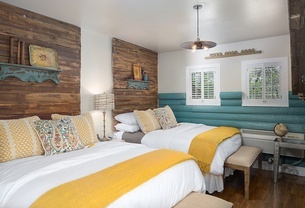 Each bedroom has a queen size bed. There are two full bathrooms, a full size kitchen, and a custom made pool table. This cabin is ideal for couples, families or a group of friends to enjoy nature and each other. Outside there is a hot tub, grill, and fire pit area. If you are looking for an ideal rustic getaway without giving up any of the amenities of home, look no further. Affinity Retreat Cabin is all that and more! This beautiful, four thousand square foot hacienda is located on fifty acres with a fantastic view of the famous “Devil’s Backbone”, which is one of the most famous scenic tours in Texas. This jewel sits on top of a hill with three hundred and sixty degree panoramic views that are never ending. With expansive decks throughout the gentle breeze can be enjoyed by all. Just outside of Austin, TX, nettles among the hills and streams of the Hill Country, lies the charming little village of Wimberley. 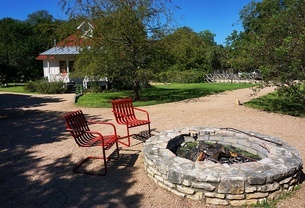 Folks visit Wimberley to feel like they’ve traveled back to a bygone era where kids swing off ropes into creeks, everyone knows their neighbor, time slows down and summer nights under the stars last an eternity. At the Moonshiner Cabin we can help you embrace that nostalgic longing.